This post was made possible by Double Duty Divas and Spinmaster Airhogs. I was compensated for my participation in this campaign, but all opinions are 100% mine. Kids now days have the coolest toys. Recently I was able to participate in a campaign that involved a new toy on the market! I have a feeling that this will be a hit this Christmas! I received the Spin Master Air Hogs Vectron Wave! Spin Master’s legendary Air Hogs brand celebrated its 15th anniversary by pushing the boundaries of R/C innovation and fun by sending one of its most iconic toys, the Vectron Wave, into the stratosphere at an altitude of 100,259ft/30,559m. To celebrate its first successful trip to space, Spin Master is sharing extraordinary video footage of the Vectron’s unique journey online and launching an “out-of-this-world” contest where a family of four can win a four-day trip to Space Camp in Huntsville, Alabama. This toy is pretty amazing if you ask me! It can be controlled with your hand! This toy is marketed toward boys, but in this household, I believe that male or female- you can play with everything! My daughter ( a somewhat tom boy) agrees too! Our product came in this awesome case! It looks pretty cool and opens and closes easily! Check it out: More about the launch! The Vectron Wave reached an altitude of 100,259 ft / 30,559 m! How cool is that? The project relied on 3D printed parts to build camera mounts and fixtures to capture footage! A number of GPS technologies were used and were crucial to locating the Vectron Wave upon landing. I love the space feel, seeing as it totally looks like a UFO when turned on! The Vectron Wave comes with a remote of sorts. You can push the button to make it stop! The controller also has the charger built inside of it. Just pull it out, plug into the Vectron Wave, and turn on the on button! The Air Hogs Vectron Wave is the UFO that you control. Wave Control™ altitude-sensing technology allows it to rise up and hover over any hard surface without using a remote control! See it in action by my daughter below! I love that she can use her hand to control it! This bad boy goes SO high too! Be careful to not stick your fingers in the blades. All though they are plastic- it still HURTS when they are smacked. That is why they have the controller! Lydia also received SPACE ICE CREAM! How neat is that to go with this theme? Now, when you purchase this product in store, please do not expect to receive this. This was included in my review package to go with the space theme. Anywho- Lydia received freeze dried chocolate ice cream with chocolate chips. I was a bit skiddish to try it at first. She gave me a piece and we tried it at the same time. Holy COW. This is delicious! The look on her face tells you that she enjoyed the first bite! Looks so weird! But I promise it is oh so good! Overall, we are thrilled with the Air Hogs Vectron Wave that we received for a review. I am so thrilled that I am recommending this for my 2014 Holiday Gift Guide! How much is this going to cost you? Well, it is the low price of only $24.99! You can find this in most retailers such as Target and Walmart too! Completely affordable for hours of fun! Visit Air Hogs on their website via one of the links in this post! You can also find them on their social media below! Like this post? Feel free to hover over a photo and Pin to Pinterest. You can also share via one of the buttons below! Thanks for reading! 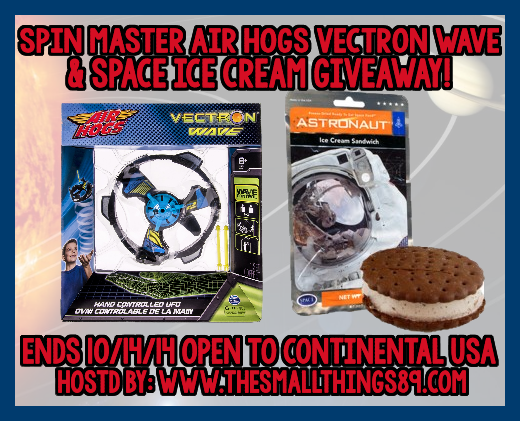 WIN IT: One reader is going to win their own Spin Master Air Hogs Vectron Wave & their own space ice cream sandwich!! I received an additional item and was told that I can give this away here on my blog! This giveaway ends on 10/14/14 at 11:59 PM CST! This giveaway is open to the Continental USA (Due to Shipping). All entries are verified! No purchase necessary. Enter with the giveaway tools below! Goodluck! I would love to have because I know my son would love it. They have all asked for a game system for Christmas! I'd love to in this, because I still need to get gifts for four kids, and because this would make a great gift for any of my three boys. I would love to win this for my nephew. He loves Air Hogs and this is one his wish list for Christmas! This would be for my nephew who loves Air Hogs! My boys love anything from Air Hogs. I know they would have fun with this. It would make a great Christmas present for one of them! I would like to win this because I know my kids, AND my husband would really enjoy it. Great father and son time is why I'd like to win. We'd have a good time together. I love to give this to my nephew Johnny! I really want to win for my son so him and I could have father/son time together playing this. Cool toy! I would so love to win this for our Grandson. This is the kind of toy that pulls the whole family together to play and laugh. This would be an awesome Christmas gift! I know my boys would love this. Lego sets from the Lego movie are on their wishlist. I would love to win this for my nephew! My son wants everything this year! This toy looks so cool. My husband would play with this and so would my girls.